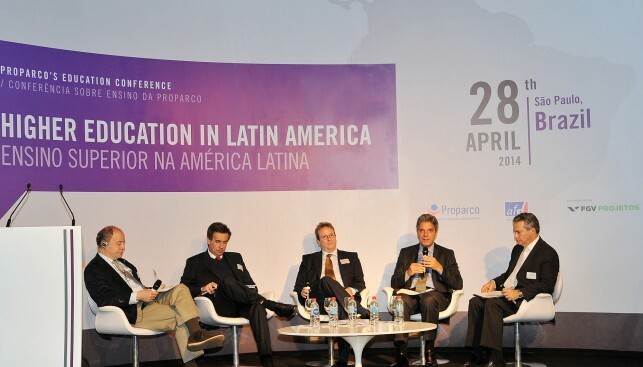 The conference organized in two panels, the first of which being dedicated to the challenge of expanding the access to a higher education of quality in Latin America, and the second of which being dedicated to the link between higher education and employability. The second debate had the lecture and moderation of the project coordinator of the FGV, Luis Fernando Rigato, providing an overview of the primary trends in higher education in Latin America and Brazil over the last decades and the importance of facilitating the transition of youths between educational institutions and the labor market. Other specific views of the challenge of employability were offered by Eduardo de Oliveira, educational superintendent of the Company-School Integration Center [Centro de Integração Empresa-Escola, or CIEE], Dionísio João Parise, manager of strategic alliances of SENAI, Father Luis Fernando Múnera, professor of Pontificia Universidad Javeriana (Colombia) and João Ricardo de Siqueira Cavalcanti, HR officer of Lafarge (Brazil).